In the far northeast of India, lodged between Tibet and Bhutan in the tiny state of Arunachal Pradesh – “the land of dawn-lit mountains” – lies a lonely valley, surrounded by snow-capped mountains. Here, high up on a spur, is Tawang Gompa, India’s largest Buddhist monastery. Although you can get there by helicopter, the most rewarding way to reach Tawang is by joining the locals and wedging yourself into a “sumo”. These shared jeeps – packed to bursting point with people and possessions – shuttle along the 345km road to the city of Tezpur in Assam, an exhausting journey that takes anything from 12 to 24 hours, depending on the weather. Along this winding route of orchid groves, primeval forests, glacial streams and ice-blue lakes, darkly humorous road signs with phrases like “Be gentle on my curves” and “Overtaker, meet undertaker” warn drivers to take care at the wheel. The numerous military bases strewn along the route are potent reminders that the region remains a bone of contention between India and China – the latter occupied the area during the 1962 Chinese-Indian war and still lays claim to it. At the breathtakingly high (4300m) Sela Pass, the sumos stop at a tiny wooden hut, the Tenzing Restaurant, where passengers crowd round a wood-fired stove and drink cups of salted yak-butter tea. From here, the road curls down into an isolated valley, and eventually Tawang itself, a sleepy end-of-the-road town filled with Buddhist prayer wheels and flags. A few kilometres beyond is the monastery itself. 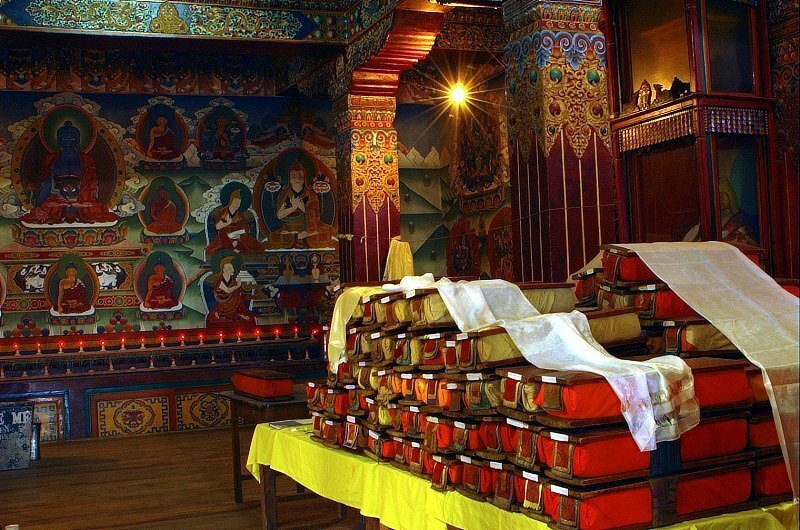 A colourful fortified complex, it was the birthplace of the sixth Dalai Lama and remains home to around five hundred monks, as well as a priceless collection of Buddhist texts and manuscripts. The monastery is most atmospheric in the late afternoon, when the setting sun bathes the place in a gorgeous orange light. As you gaze down at the valley below, with its isolated ani gompas (nunneries), tiny hamlets, glistening lakes and sheer mountain slopes, it is hard to escape the feeling that you’ve discovered your own, personal Shangri-La. Find out more in The Rough Guide to India.